Could Nissan's Electric Minivan Crush Tesla's Model X? Nissan's electric minivan enters service with Google on a test basis. I drove the first car on U.S. soil. Here's what I've learned. NEW YORK (TheStreet) -- Earlier this week, I became one of the first people on U.S. soil to drive the Nissan electric minivan. If all testing goes well, it may be in U.S. Nissan dealerships approximately a year from now. Recall that Nissan delivered its first all-electric LEAF family car in December 2010, and passed 110,000 units earlier this year. The carpool lanes in California are so jammed with LEAFs, it almost looks comical. For all of Nissan's success with the LEAF, however, there are many people who simply want some form of larger and/or taller car. As is oft-discussed in the auto world and in online forums, some people need to fit in more people, some people need to fit in more luggage, and yet others just prefer a taller car because they are taller, older, or have stiffer backs. The electric car world is screaming for more minivans. Tesla (TSLA - Get Report) figured this out a long time ago. Tesla plans to start manufacturing the Model X minivan in 2015, if the development schedule is fully executed; they originally scheduled first deliveries for December 2013. Just by showing a concept car in February 2012, Tesla allegedly has taken more than 12,000 deposits ranging from $5,000 to $40,000 apiece. However, the Tesla Model X will likely cost close to $80,000 to start, and have an average selling price of at least $105,000, with fully loaded models going for closer to $135,000. That's a lot of money. What if you wanted to pay one third as much -- $35,000 -- for an electric minivan? That's where Nissan comes in. If Nissan delivers its new electric minivan for $35,000, you would be able to buy three of them for the expected average price of one Tesla Model X. That may be an attractive proposition for many U.S. families and small businesses. Fortunately for Nissan, it had already developed a highly utilitarian minivan, which it is already selling around the world. It's becoming a taxicab favorite in the world's largest cities, and I'm seeing more of them every day serving as urban delivery vans. Given the physical properties of a front-wheel drive minivan, it was extremely easy to repurpose for battery-electric drive. Production started in May 2014 in Nissan's gigafactory in Barcelona, Spain, for deliveries in the European markets. This compensates in part for the lack of a telescoping steering wheel. You can sit more upright, without coming even near hitting your head in the ceiling. The drivetrain is substantially identical to the LEAF. This means it feels fast and smooth. In its initial configuration, the 24 kWh battery is unlikely to produce a greater average range than 70 miles, with 100 miles being a potential in slow city traffic. This makes it OK for "school, soccer field and supermarket" as well as for city delivery services. The Nissan electric minivan is narrow and short, making it extremely easy to drive and park. Yet, the interior space is outstanding. It is ideal for a trip to IKEA. What improvements can we expect for the Nissan electric minivan in the next couple of years? I see three major vectors. Clearly this car could benefit from increasing the battery's capacity from 24 kWh to 36, 48 and 60. In various steps from the initial 70 miles of range, the largest configuration could yield approximately 200 miles of range. This final stage would not appear until late 2016 at the earliest. One can easily envision a version that is a foot longer, which would enable having a third row of seats while still having lots of luggage space. It would still be shorter than most cars. Clearly the Nissan minivan could benefit from a telescoping steering wheel. The seating position needs to be more comfortable for people who are above six feet tall, and don't have very short legs. Some people will clearly object to the idea that this car would ever take any sales from a Tesla Model X minivan. These cars are very different! I agree. Not only is the Tesla most likely three times the price, but it will be larger, including much wider, be more luxurious, have much longer range, four-wheel-drive, and so forth. From this, do they really compete? Perhaps not, but there is a big gray area. Many families or businesses will use this as their second or third car. It may only run short sub-70 mile routes around town. When you consider that it is much easier to park, and costs one third the price, there will be some cross-shopping. In addition, if you are transporting goods or kids, then parking it where there are more kids and goods near the car, you may not want to do so in a $105,000 average-price minivan. It may be more appropriate to do this in a $35,000 Nissan electric minivan, where you are not so concerned with dings or spills. Nissan's gigafactory in Barcelona, Spain, is spitting out affordable electric minivans today. The initial version may appear in the U.S. within a year. 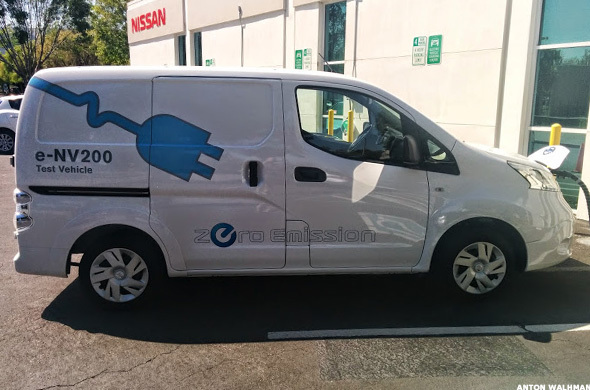 Nissan is now having the electric minivan enter service with Google and a few other innovative companies on the West Coast, on a test basis. When Google fully enters the transportation business, Nissan is a logical vehicle and battery partner. Nissan has capacity in its global gigafactories today, not only in Europe and Japan, but also in Tennessee. At the time of publication, the author was long GOOGL but held no positions in any of the other stocks mentioned.